HELSINKI, Finland — Two days before the opening on Wednesday of Oodi, Helsinki’s new central library, its director, Anna-Maria Soininvaara, stood before some of the high-tech equipment that would soon be available for the public to use. She wasn’t entirely sure what it all did, she said sheepishly. The devices included a laser cutter, computerized embroidery machines and equipment to digitally sculpt wood. In one glassed-in area on the building’s second floor, Helsinki residents could repair personal electronic items by 3D-printing replacement parts and soldering them together. Ms. Soininvaara’s uncertainty was understandable: The 59-year-old, who has worked in the Finnish library system for three decades, is more of an expert on literature than on high-tech engraving, and Oodi — which means “ode” in Finnish — isn’t exactly a normal library. Given its breadth of services, one might be forgiven for wondering whether Oodi should be considered a library at all. A swooping three-story construction of wood, steel and glass that looks like a ship topped with a layer of ice, the new building, which cost 98 million euros, or around $110 million, including equipment, is one of the most anticipated public projects in the country in years. It is an ambitious attempt by one of the most literate and digitally savvy nations in the world to reinvent the library for its population’s future needs. “Books are important, but it’s not the whole library,” Ms. Soininvaara said. She pointed to Oodi’s recording studios, kitchen, gaming room with PlayStation consoles, and an “immersive 3-D space,” a room whose walls can be illuminated with digital projections, available to artists or for corporate presentations. The result of two decades of planning and public consultation, each of Oodi’s three floors was built to fulfill a different civic purpose. Its expansive ground floor, which includes a restaurant, movie theater, European Union information center and several areas suited for concerts, is meant for events that encourage Helsinki’s residents to mingle. The second floor, with electronic equipment and workrooms, is for noisy creative activity, and the top floor, an open-plan, brightly lit “book heaven” with rows of white stacks, is a conventional, if inordinately tasteful, reading room. “We took into account the fact that libraries will always be changing,” said Samuli Woolston, a partner at ALA Architects, the Finnish firm behind the building. “Already, their use is different now from what it was 10 years ago.” New functions, he explained, could easily be accommodated into the building’s design. Tommi Laitio, the city’s executive director for culture and leisure, explained that the building and its expansive technological offerings were partly intended as a bulwark against populism. In 2015, the right-wing, populist Finns Party joined a coalition government. Jussi Halla-aho, the party’s leader, once argued that solving Greece’s debt crisis would require a military junta, and he has linked Islam to pedophilia. “This is very much a political project,” Mr. Laitio said, arguing that threats to democracy across the globe in recent years could be explained partly by people’s uncertainty about technological advances. Oodi’s high-tech equipment is intended to counteract those fears. “It allows people to experience the future so it doesn’t feel so intimidating,” he explained. With their generous publicly funded benefits, Nordic countries place a high premium on social integration and education, and, based on 2014 figures from the Institute of Museum and Library Services, the Finnish government spends more than one and a half times as much per capita on libraries as the United States. 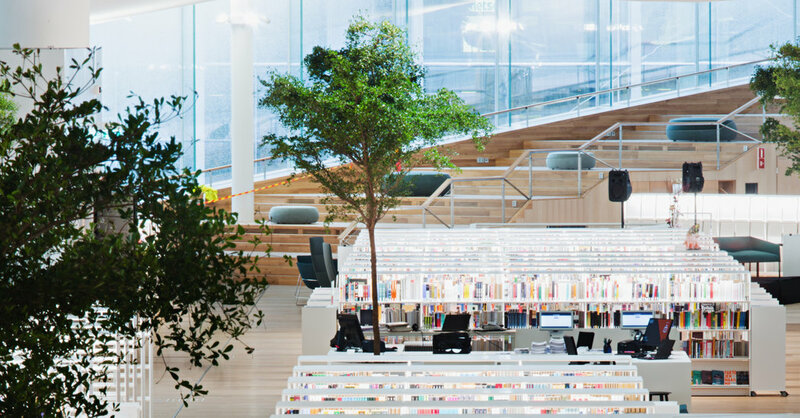 The Nordic countries are emerging as leaders in library design. Dokk1, a state-of-the-art “hybrid library” with “maker spaces,” a passport office and a playground, opened in Aarhus, Denmark, in 2015. It was named “public library of the year” by the International Federation of Library Associations and Institutions a year later, and its visitor numbers have grown significantly. Oslo’s new central library, which is due to open in early 2020 on the Norwegian capital’s waterfront, is expected to include a movie theater, gaming area and workshop for visitors to use digital equipment. The Nordic countries have been faster to embrace digital technology than most, and Mr. Laitio argued that Oodi points to a way forward for library systems across the world that have struggled with digitization and budget cuts. The building, he said, is intended for use as a co-working space and a town square, and tries to appeal to a broad range of demographics. “We have to make sure that libraries aren’t just relevant for people who can’t afford books or a computer,” he said. Oodi is to begin mostly normal operations on Friday, after a two-day opening celebration with concerts and speeches by politicians, including the Finnish president. Its architects noted that the building’s balcony was built to be at the same level as the stairs to the Parliament building across the square, a symbolic gesture to indicate that learning is as important in Finnish society as politics. July 31, 2018 Comments Off on From TripAdvisor, a Program to Help Refugees Get to Know the U.S.